One of the first tasks when getting to a brand new SEO project is to assess the state of on-site optimization. That is the place where we usually do the first measurement of ”how bad the things really are” or “how badly the previous SEO company screwed up” . One of the most basic tools that I always used for this task is Xenu Link Sleuth. It was great for looking at possible crawling problems, getting server headers, checking alt tags on images etc. However, the problem with Xenu was that it is not an SEO tool. As the on-site SEO changed, so did the requirements of the indexing tool. All of a sudden, I wanted to see what pages have a canonical tag, what pages have duplicate metas issues, whether any pages have robots metatag issues and Xenu just doesn’t do this. Enter Screaming Frog SEO Spider. If Xenu had a brother that did SEO, that’s what it would look like. It is a great tool and one of the landmarks of a great tool is constant discovery of new ways it can be useful. It has saved me numerous hours, mostly at the initial site audit stage. Investigating distribution of onsite links – When large websites want to promote a certain section of their site, one of the ways to do this is to increase the number of links to that page/section from other pages on the site. If the promoted page is found deep within the navigational structure, this will bring it closer to the root and increase the linkjuice flow to it. An overview of internal category/product pages that have a larger than usual number of on-site links pointing to them can help us identify competitor’s SEO campaign targets. Furthermore, if we cross examine these promoted pages with the number of offsite links to internal pages, we can gain some nice insights about promoted products, targeted keywords, linking strategies and other aspects of SEO campaigns. Identification of images without alts – this is especially true about images that serve as links. In addition to the capability of filtering images without ALTs, there are other options, as in filtering images that are larger than 100kbs or filtering images that have a long ALT tag. Searching link prospects for broken links you can replace – as a part of link building process, you can go to a linking prospect site, run the spider on it and get a list of all outgoing links that result in 404. Go to the linking pages, find out what was the linking purpose and the context of the broken link. Then you can either create a similar resource on one of your sites or tweak your existing content to fit the linking intention and contact the linking prospect, alerting them about the broken link and pointing out similar helpful info on your site. 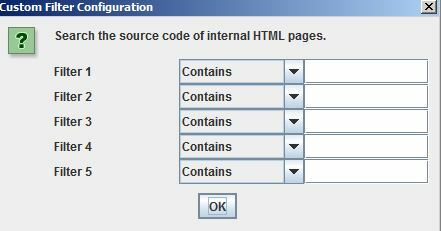 Search inside the HTML source of pages – this is one of the recent additions to SEO Spider. 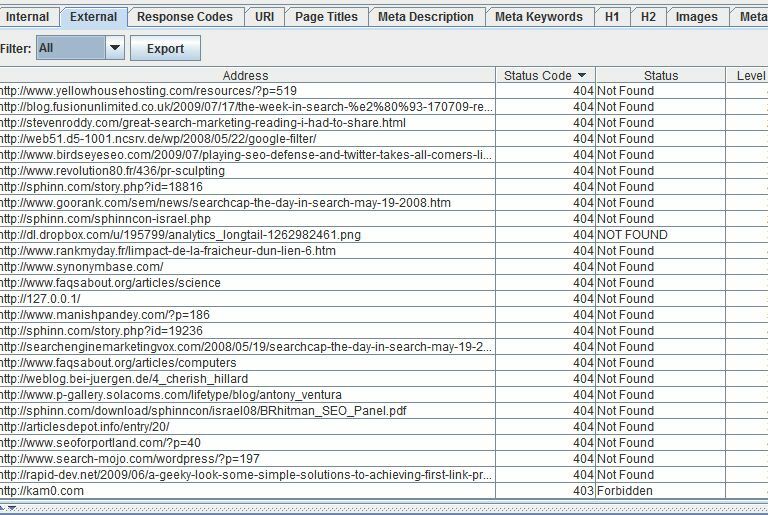 It can be very useful if you want to find all the pages linking to a target page with a specific anchor text or look for tracking code within pages. Up to 5 custom searches can be defined in the Configuration section. I have been playing with the Screaming Frog tool for a couple of weeks myself and I have to say it does offer some excellent insights. 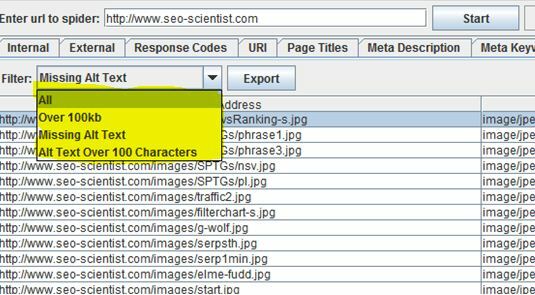 I do also use the IIS SEO Toolkit as well and it does no harm at all to use both, the run time on the SEO toolkit is a little quicker (dependent on site size) but as the Screaming Frog tool develops I am sure that may already be on their hitlist. On the positive side this tool is a hell of a lot easier to install than the IIS SEO toolkit. 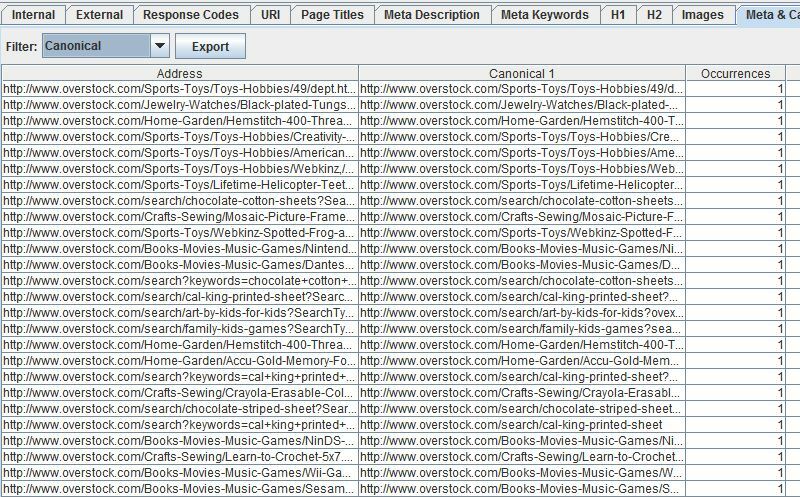 The Screaming Frog SEO Spider is an excellent tool for analysis, especially when reviewing large ecommerce sites. Great time saver, the paid version is worth every penny. wow, great tool! I use Xenu several times a week for many years, but this one blows it away! I’m testing it right now and I’m very impressed, and considering buying the unlimited version. Thank you for this great tip & article ! The pages then get a 404 in the tool. Neyne, thanks for the great review we’re really pleased you like the tool! Xenu is my fav tool ever. Not elegant my any means but very functional. Thanks for reminding me about this great tool. I will look forward to your updates. Not sure how I will know about them. Maybe add a subscribe to comments and drop a message when you update the post. I don’t really use RSS any more. The larger the site, the higher the demand for tools such as this one… Thanks for sharing your examples! The developers told me that they’re hoping to release a Mac version as early as next week. Woot! I’m going to confirm what you already know, just because. There are a lot of articles about SEO software, and the only reason I clicked on the link for yours is that you mentioned XENU. Very clever. And I’m certainly glad you are, because this description makes Screaming Frog sound awesome. I’m gonna download it right now. I hadn’t heard of either of these before, but the Screaming Frog SEO Spider is definitely interesting. Cheers for the tip. Gonna have a play around and see what it can do! I have problem with Xenu and other software to crawl really big sites, like with a million pages, when you can’t split it in parts. They all crash with an out of memory error..
Do you know if SEO Spider can manage it? This software looks amazing. Im going to have to test it out and review it on our site. Really better than Xenu. Nice tools. I’ve been using Screaming Frog for a few months now and just love the functionality and ease of use. Well done on this write up. A very useful review and tutorial. Wow. Ive been using Xenu for awhile now and have been annoyed at it’s limitations for large ecommerce sites. This tool grabs the Anchor texts and H tags! First time I’ve been here, and obviously I’ve been missing out. I was searching for checks on bait & switch and I’m happy to find a clear answer and even better that I’m already using ScreamingFrog. Nice one. firs off all’ thx for agreat article. the Xenu is amust tool, to all peple thet working on abig sites. i working with Xenu evry allmost evry day and it giving me new look on the insite. Thanks for sharing your Your experience with this wonderful tool. I use both for case something will go wrong and for double checking. Must have tool for every seo – specialist. 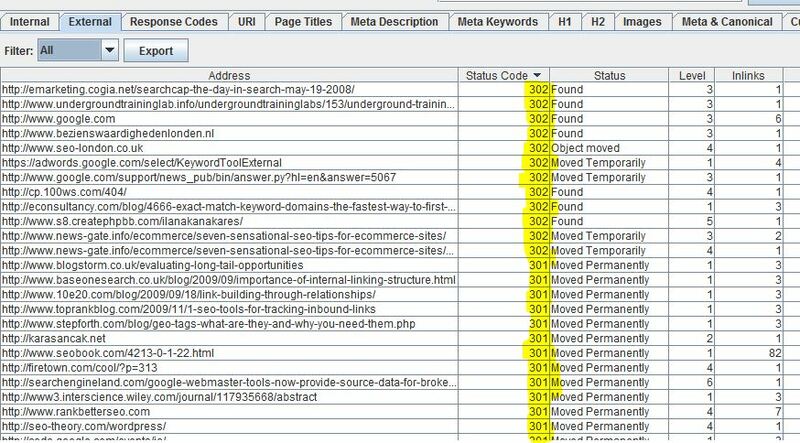 I like the added advantage of usability as well as easy parsing of important SEO data. BUT… The tool is simply not as industrial strength as I’d like. I’ve communicated to the Screaming Frog team numerous times but have only been able to achieve small incremental results. I need a tool that can quickly crawl an eCommerce or large content site with over 100K pages. It take SF nearly an hour to get to a few thousand pages and then crashes. The most I’ve been able to achieve so far has been about 10,000 pages and took more than an hour. Do I have unrealistic expectations here? Please advise. Thank you! I feel you with the crawling limits. I think your expectations are somewhat unrealistic. It is a desktop tool and there are limits that are imposed by your system requirements as well. Also I don’t know of any other similar tool that can crawl that many pages in such short time. If I was you, I would install the Screaming Frog on some VPS and let it run for as long as it takes. Like you we use the paid/pro version – worth every penny!